AMBROSONICS Guitars Custom assembled in the USA! Custom HD Audio Hybrid Analog/DSP Preamps designed and made in the USA. Passive Pickup Switching featuring Patented Multi-Tonal Pickup Switching. Programmable Pickup Selection featuring Patented Pickup Director Systems. 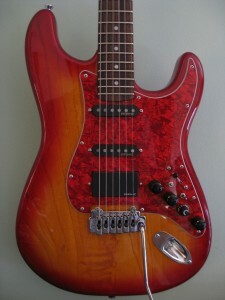 Item Name: HD DSP-45 Guitar w/EMG humbucker & 2 single coils. Description: Beautiful transparent natural/red burst swamp ash body with quilted maple top and maple neck. Controls: Master Volume/On/Off, Distortion/Gain Level, DSP Effects Selector, Effects Level, 5-Position Pickup Switch, 3-Position Distortion Switch and True By-Pass Switch. Pickups: EMG passive HZ series through our HD DSP-45 Preamp. True Passive By-Pass Switch: A 3PDT Switch bypasses all electronics. The Master Volume control becomes a passive volume control! No 9 volt battery is required in By-Pass mode. Other Specs: Wilkinson/Gotoh VS-100 Fulcrum Tremolo Bridge, Gotoh 16:1 Tuners, 25 1/2 inch fret scale, 22 medium jumbo frets, 12 inch radius. 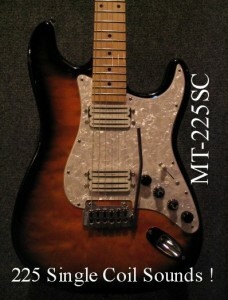 Item Name: MT-225SC Guitar w/Seymour Duncan cool rail single coil pickups. 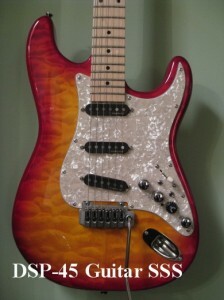 Description: This guitar model has 225 Passive Single Coil Sounds! A beautiful transparent natural/black burst swamp ash body with quilted maple top and maple neck. Controls: Master Volume, Multi-Tonal Selector 1, Multi-Tonal Selector 2, Tone Control, 3-Position Pickup Switch. Electronics: Custom MT225 Patented Multi-Tonal Passive Switching Systems. NO BATTERIES REQUIRED! Pickups: Seymour Duncan Cool Rails passive pickups. Description: Beautiful swamp ash body with quilted maple top and maple neck with rosewood fretboard. Item Name: HD DSP-45 Dorothy Guitar w/EMG humbucker & 2 single coils. 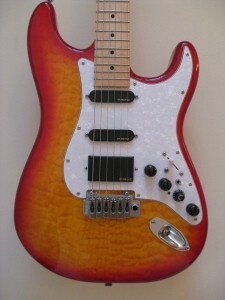 Description: Beautiful transparent natural/red burst swamp ash body and maple neck with rosewood fretboard. Other Specs: Wilkinson WVS 50 II K Fulcrum Tremolo Bridge, Gotoh 16:1 Tuners, 25 1/2 inch fret scale, 22 medium jumbo frets, 12 inch radius. 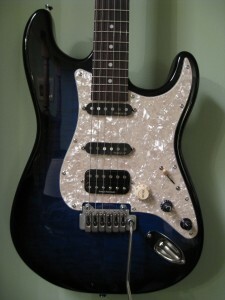 Item Name: HD DSP-45 Guitar w/EMG 3 single coils. Item Name: HD DSP-45 MP3 Recording Guitar w/EMG humbucker & 2 single coils. 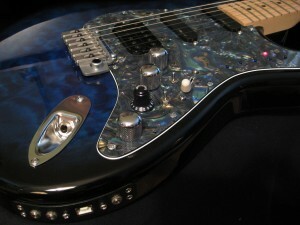 Description: Beautiful transparent blue mist, swamp ash body with quilted maple top and maple neck. Controls: Master Volume/On/Off, Distortion/Gain Level, DSP Effects Selector, Effects Level, Record, Play, Next, Previous, MP3 Volume Up, MP3 Volume Down, Dual 1/8″ Stereo Headphones Out, MP3/AUX 1/8″ Input and USB I/O Port for download/upload file transfers. Electronics: Custom HD DSP-45 AMBROSONICS Preamp with on board MP3 Recording System and USB Port!